I am really really happy with your company from start to finish. Very professional and dependable all the way around. I'll be giving you guys 5 stars on Yelp in the next few days. Awesome job! Thanks for the unbeatable prices and great service. You helped make our day a huge success! My go to for jumpers . They have a great selection ! The guys who set up the jumpers are fast and professional. I've been using the jumpers for 9 years now. I have been renting jumpers for 3 years now from this company. Once we used them for a birthday party El Carisso park in Sylmar. We have used the mb at home as well. The jumpers are ALWAYS CLEAN! They do not look beat up or torn. I have NEVER in my life seen jumpers this amazing! The 5-1 combo is a great deal! Once inside it has a basketball hoop, slide, stairs, and extra room for bouncing around. They never disappoint. Excellent customer service. THANK YOU! Rent from this company over the weekend for our church event, everything went smooth, from reserving the jumpers we where going to use to the delivery and pick up process, everything was done on time and agreed upon before, Martin the person who helped me reserve the jumpers was extremely helpful and walked me through the whole process, from how many outlets we would need to properly get the jumpers to function to suggesting different type of jumpers we might be interesting in. The delivery was done on time and went extremely smooth, delivery person had the proper tools and knowledge on what was the best set up for the event and everyone loved it. If I could give a higher rating I absolutely would. I had a party on June of 2015. The park/facility that I had rented was being super difficult and demanding. My party would not have happened is it was not for the persistence and determination as well as the willingness put forward by the individual that runs this business. He had to literally meet with the city of Glendale in order for us to be able to have our party at the facility. He went above and beyond and I will definitely be using them for all of my upcoming events. I highly recommend using them for any event you may have as they have proven that not only are they affordable but their willingness to help in a difficult situation shows they are some amazing upstanding people. Ordered a jumper and tables for my son's bday. Delivery showed up early and everything was in great shape. Very professional operation and reasonably priced. hape. Very professional operation and reasonably priced. hape. Very professional operation and reasonably priced. They are great! 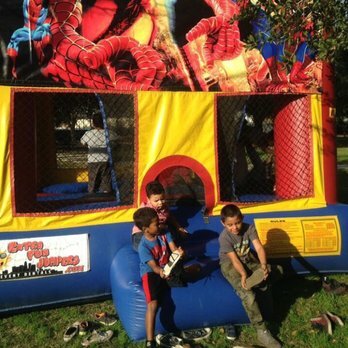 We have used Extra Fun Jumpers for bounce houses and table and chair rentals for my kids birthday parties at our house in Santa Monica, and just recently we used them for a tent, tables, chairs and heat lamp in our backyard for Thanksgiving. They are always professional, courteous, on time and reliable. Their website makes it super easy to order things. I think they are great and am so glad they exist!